Though originally published in 2013, tax season is the perfect time to reissue this compelling look at the anti-tax movement in America, as documented by a sociologist specializing in public policy and social protest. 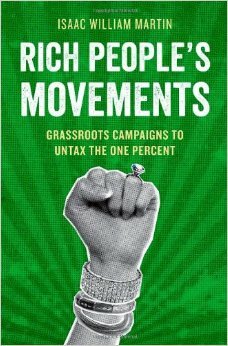 Rich People’s Movements begins with the Tea Party protests of 2010 and traces the history of anti-tax sentiment back to the Sixteenth Amendment. More than mere history, this book examines the ways the affluent borrowed the tactics of the poor and powerless, who, without the ability to confront power with money and influence, took to the streets to make their voices heard. Why would those with power and influence rely on a protest movement? Martin answers this question and many more, such as why the working poor will sometimes rally to the defense of the 1 percent and their economic policies. Also available is Martin’s new book, Foreclosed America, co-authored with Christopher Niedt. This is a collection of portraits of Americans who have lost their homes to foreclosure since 2007 — and a look at the housing crisis that still affects our economy and way of life.